Last weekend I attended ShmooCon, a yearly security conference held in Washington D.C. Today I want to explore several common themes I noted in many of the great technical presentations at the conference. For many years, the community has been saying that security is facing an operations challenge, not simply one of just technology and cash flow. Simply put, most people aren’t following our advice. Administrators aren’t reviewing logs, systems are still unpatched and users are still running as administrators. Risk increases every day when people don’t do the right thing; this is the fundamental reason most people get successfully attacked. In many ways, this flaw in operations is like having a horse. You build a great stable. You put in lights and a heater. You put nice locks on the doors. You build out the plumbing system so the horse can have fresh water and then finally … you buy a horse and put it in the stable. Sadly, most companies get to this point and then, after spending tens of thousands of dollars on their horse, decide spending $100 on oats is too expensive and just toss scraps into the stable as time permits. Sadly, we live in a world full of dead and starving horses. Fortunately, not every business is as behind as most we see. There are many businesses doing security right. They are investing money to protect assets, training employees and seamlessly running operations. These companies are succeeding, and as a result, the gap between “good” and “average” is widening dramatically. To get back to the horse metaphor, we no longer have a single race. Instead, we have two. In the first, people are riding their horses much as you’d expect. 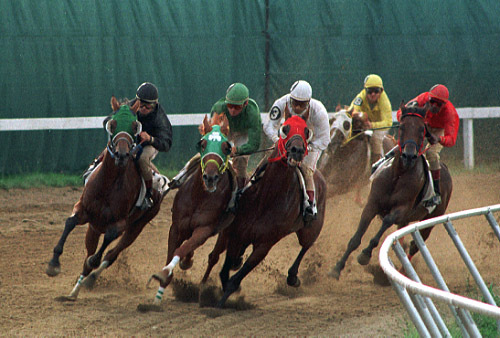 In the second, businesses have invested in security but not operations, dragging their dead and dying horses around the track. These races work very differently and therefore are attacked differently. If your operations are failing (as in #1 above), your horse may not be worth much. However, if an attacker can get a nice pile of dead horses, they can sell them for glue. In other words, these are the low-level attacks we see every day zeroing in on credit cards, ACH transfers and customer data. Attackers focus on bulk theft and you are just a convenient target. However, if you have good security AND good internal operations, you’re in a different race. A horse thief focusing on live horses is going to have more options than one who raids the graveyard. The attacker who selects a company with good operations will see greater value from a successful attack. If your company is investing in day-to-day operations, odds are you have some juicy intellectual property to protect. This is where these attackers focus. In either case, if you’re behind more than half the horses in the race (i.e., below average), you’re going to lose. Remember, the attacker just has to win once… you have to deflect the attacks constantly. The attackers are targeting the easiest in each category first, so as horses vanish from the race, you have to keep improving to stay above average. Finally, there is the true value of an event like Shmoo. The value isn’t in the sessions (though they are great), but in the discussions in hallways and over meals. This is where security people get together and share ideas as to what techniques work to defend against these attacks. We brainstorm and share intelligence. This helps us protect our own little corners of the world better. To beat the horse metaphor to death, it is as though an international team of horse rustlers (hackers) specialize in stealing horses (your business). Some are great at stealing wagons and have no idea what horse they’ll be getting. Others team up and have one person good at riding horses, one at distracting jockeys and maybe a large animal vet to determine how best to use the newly-stolen horse. They share ideas with other teams as to what has worked and what hasn’t, thus they constantly improve. At Shmoo, we share ideas that keep our horses from being stolen. It could be as easy as putting better locks on the stables, or as ridiculous as using velcro saddles to keep the jockeys firmly seated. In many cases, it is about small improvements … ways to feed the horses more cost-effectively, or the ability to keep an extra set of eyes on people approaching your stable. In other words, going to Shmoo isn’t likely to help you, but it will certainly help me help you. Now, let’s talk about your horse. For those who don’t know, when attackers successfully breach a system, they often share the information they find publicly on the internet. For those on the illegal side of Information Security, this awards them the satisfaction of adding another notch on the scoreboard and further shames those who have poor security. For people like me on the legal side, we receive the ability to gather passwords used in the real world and analyze commonalities, variations and patterns. For this reason, I have several automatic searches that notify me when certain information gets leaked. Recently, I was alerted to a situation that occurred at the George Washington Middle School in Ridgewood, New Jersey. I won’t link to the actual leaked data, but suffice to say it contains enough administrative information to access their systems. I did not verify this to the point of logging in, but it certainly looks correct and the leak has already been plugged, thus illustrating the sensitivity of the information revealed. Besides the data mentioned above, the leak also contained usernames and passwords for 246 sixth graders. You’d think with 246 young students, you’d see 200, perhaps even 225 unique passwords, right? And if default passwords were created for them by a network administrator, you’d hope all 246 were unique. When analyzing the data, however, there were only 34 unique passwords. 34! In all the analyses I’ve done, this is by far the worst. There are a handful of possible scenarios here. Ignoring the possibility this is completely fabricated (the usernames of the children make that seem somewhat unlikely), this is either a set of passwords that were generated for children or by children. Given how evenly matched the passwords are in distribution, it seems more likely there was a list of 21 “default” passwords that were generated and then the students were asked to change them. Given the passwords on the right hand column, it seems as though the instructions were “add two numbers to the end of your password to make it secure.” The password of “Password” matches a username of “Username,” so it’s probably a header or a default value and can be ignored. First, selecting passwords in this way means if someone knew their password and wanted to try to get into other accounts, they’d be able to get into at least 9 other accounts and possibly as many as 14 … and that’s with doing no work at all. If you look at word pairs you get summer/winter, apples/oranges and soccer/football. This raises the number of breached accounts with inside knowledge to 25. Now, if you decided to attack this system with a default word list, it would take about a day to get hits on most of these. If you had a list of usernames, you could easily gain access to every account on this list in a day. In some systems, it would take as little as a minute to crack each account. So no one expects sixth graders to be security geniuses, but sad to say, habits get set early. Assuming the right hand column contains passwords that people changed, only 12 students changed their passwords as instructed. If we assume they were given instructions, this means we can expect 4.88% of people to follow directions. If personal experience indicates anything, sixth graders are even more likely to follow directions than adults, so in an average organization, we can assume less than 5% of people will follow best practices … and they’ll probably do the bare minimum required of them. The system required passwords to be at least 12 characters long. What would happen? First, the student would probably write his or her password down somewhere. Now that code is as safe as a locker and/or the student’s resistance to bullying. Maybe there’s a better way. If someone wanted to use a basic word like “winter,” the system wouldn’t accept the password. “Zoologists” on the other hand, would be accepted. If you wanted something shorter, you could go with “like2″ to obtain your required score of 100 (a base of 20 * 5). This is the basic idea of password scoring. You could decide for yourself what metrics to use, but by raising the threshold score and weighting various characters differently, people are driven to select their own passwords. Using the rules above, suppose you wanted a specific score of 1000. “Jooxiepa8da X1Zaode!” would work, but so would “Ask not what you can do for your country.” Which is easier to remember? This is how you generate passwords to meet an arbitrary security threshold that are easy to remember and hard to crack. Since people don’t follow directions (5% change rate) and write down hard things to remember, this is one of the best systems you can implement. Sure, multifactor systems are better, but I don’t think sixth graders would be very good at keeping track of their magic “log me on” device. So instead of teaching them horrible password security from an early age, maybe we should implement a system that understands that humans, of whatever age, are human. In fact, maybe we should do this in business too. This post is part 3 of a series. Please see posts 1 and 2. I like to follow the old cliche “Learn One, Do One, Teach One”. So you’ve learned something. The next step is how do you do something with it? Since we’re talking about security, the best option would probably be to stop a bad guy. Sadly, that’s not always feasible. Fortunately, you have some options. One thing I strongly suggest is joining an open source project. I used to suggest starting one, but it seems that whenever I said that, someone would run off and make a new network scanner. We have enough of those. Join a project that uses modules. Metasploit is good. So are SET and NMap. If you’re webby, take a crack at extending w3af. This will force you to understand a system, improve a system and work with others to get your change accepted. In short, it demonstrates everything that a prospective employer wants. Suppose you’re not a programmer. That’s OK. You can use the tools above to run assessments. Assess your home network to learn how everything works then start calling local non-profit groups. Offer them scan in return for the ability to post a summary of the results online (after they approve the anonymization of the data). Now, there is a bit of risk here, so you might want to investigate error and omissions insurance before hand. At the very least, consider one of the “approval” forms so that you’re protected. Learning the ins and outs of these sorts of assessments demonstrates that you not only have the technical skills, but that you can also use them in a meaningful way. Now, those two paths are all well and good if you’re technical. However, we have some people in this field that aren’t technical at all. There’s nothing wrong with that… but be aware that to be truly successful you have to understand both technology and people. Try to branch out. If you’re not going to branch out, you can still help an open source project. Documentation on many projects is… well to call it “lacking” would be like calling the Titanic “a boat that encountered a spot of bother”. There’s a lot of need there and a lot of wikis that are fully editable, so get cracking. You might also be able to help with project management, with resolving disputes on mailing lists, or by prioritizing bugs based on user impact. You know, basically doing all the tasks that stereotypical geeks aren’t very good at. The next step is to promote the fact that you’ve done something. The best way to do this is teaching, and the Internet makes this easy. Basic blogging is much like you’re reading now. Just grab yourself a domain, link it to WordPress and go. The difficulty with blogging is the tendency to lose time to “research”. If you’re new to blogging, give yourself two days (20 hours) of research time on how to blog. A good place to start are the Converstation Archives. Once you’ve done that, build a list of topics and give yourself one hour for each topic. Give yourself 20 minutes to write the content, 20 minutes to edit the content (after waiting a day or so), and 20 minutes to publish the content on WordPress (this includes adding links and images). You can spend more time than that on posts that matter strongly to you (as I did on this series), but be careful not to spend too much time. If you keep trying to make it “perfetc”, it’ll never get published. Micro-blogging is a lot like blogging, but you say more with less. In the US, Twitter is the most popular micro-blogging platform, but Facebook and Google+ are challenging it. Personally, I find this a very difficult medium. What works for me is to write a blog and then excerpt key phrases from it for micro-blogging purposes. If you’re gifted in this medium, feel free to start here. However, if you use it for professional purposes, please try to avoid the shorthand that’s common in the medium. U wont get jobz talking lik this. Vidding and podcasting are other techniques that I’m not personally comfortable with, but which work for a whole lot of people. This is as simple as sitting in front of a web camera and talking to an audience that you hope will emerge over time. My attempts at podcasting were all aborted because the editing took too much time. Perfectionism and linear editing do not mix well. I hope to give this a shot again later this year, but we’ll see. It’s very hard for me. One friend suggests that these techniques are made easier if you have a script. Granted, you have to practice to make sure it doesn’t sound scripted, but this is very good advice. I’ll have to try it the next time I give this technique a whirl. Graphically-intensive content such as infographics and comics is another way to get the message out. I’ve done tons of infographics (few are public) and a fairly large graphic novel that has been “in progress” for the last five years. The trick here is not biting off more than you can chew. If you are skilled graphically, take a shot at illustrating what you’ve done and sharing it with others. This can be a very powerful technique. There are tons of other methods. If you think I’ve missed something important, please let me know in the comments. This has been a lot of text… but hopefully this has answered your certification questions at a very high level and explained how to extend your learning. If you do this, you should gain something more directly useful to you than tacking a few letters to your name. Of course, it’s a bit more complex than this in “real life”. In addition to what I described here, each certification comes with it’s own community which may or may not mesh with your needs. Personally, I mesh well with the SANS community and not very well with the ISC(2) community… but this is extremely personal. There’s no way to know where you’ll mesh without giving it a try, so pick the certification based on what you need to learn and figure out the social aspects once your certification grants you access to a community. Similarly, the “doing” and “teaching” phases only work if you dedicate enough time to them. Your journey doesn’t end when you get the certification, so if you can’t devote the time from your life to complete the process, you should seriously reconsider whether to even get a certification in the first place. However, if you can afford the time to learn, do and teach, you should see your professional life advance extremely quickly.